(Nanowerk News) Imagine that you have a big box of sand in which you bury a tiny model of a footstool. A few seconds later, you reach into the box and pull out a full-size footstool: The sand has assembled itself into a large-scale replica of the model. That may sound like a scene from a Harry Potter novel, but it's the vision animating a research project at the Distributed Robotics Laboratory (DRL) at MIT's Computer Science and Artificial Intelligence Laboratory. At the IEEE International Conference on Robotics and Automation in May — the world's premier robotics conference — DRL researchers will present a paper describing algorithms that could enable such "smart sand." They also describe experiments in which they tested the algorithms on somewhat larger particles — cubes about 10 millimeters to an edge, with rudimentary microprocessors inside and very unusual magnets on four of their sides. To test their algorithm, the researchers designed and built a system of 'smart pebbles' — cubes about 10 millimeters to an edge, with processors and magnets built in. Unlike many other approaches to reconfigurable robots, smart sand uses a subtractive method, akin to stone carving, rather than an additive method, akin to snapping LEGO blocks together. A heap of smart sand would be analogous to the rough block of stone that a sculptor begins with. The individual grains would pass messages back and forth and selectively attach to each other to form a three-dimensional object; the grains not necessary to build that object would simply fall away. When the object had served its purpose, it would be returned to the heap. Its constituent grains would detach from each other, becoming free to participate in the formation of a new shape. Algorithmically, the main challenge in developing smart sand is that the individual grains would have very few computational resources. "How do you develop efficient algorithms that do not waste any information at the level of communication and at the level of storage?" asks Daniela Rus, a professor of computer science and engineering at MIT and a co-author on the new paper, together with her student Kyle Gilpin. If every grain could simply store a digital map of the object to be assembled, "then I can come up with an algorithm in a very easy way," Rus says. "But we would like to solve the problem without that requirement, because that requirement is simply unrealistic when you're talking about modules at this scale." Furthermore, Rus says, from one run to the next, the grains in the heap will be jumbled together in a completely different way. "We'd like to not have to know ahead of time what our block looks like," Rus says. Conveying shape information to the heap with a simple physical model — such as the tiny footstool — helps address both of these problems. To get a sense of how the researchers' algorithm works, it's probably easiest to consider the two-dimensional case. Picture each grain of sand as a square in a two-dimensional grid. Now imagine that some of the squares — say, in the shape of a footstool— are missing. That's where the physical model is embedded. To attach to each other, to communicate and to share power, the cubes use 'electropermanent magnets,' materials whose magnetism can be switched on and off with jolts of electricity. 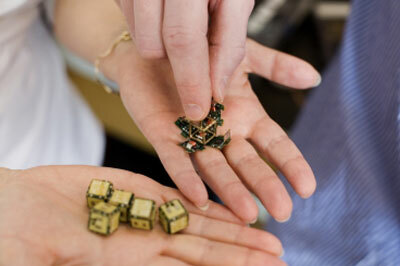 Each cube has magnets — recognizable by the reddish wires wrapped around them — on four of its six faces. According to Gilpin-author on the new paper, the grains first pass messages to each other to determine which have missing neighbors. (In the grid model, each square could have eight neighbors.) Grains with missing neighbors are in one of two places: the perimeter of the heap or the perimeter of the embedded shape. Once the grains surrounding the embedded shape identify themselves, they simply pass messages to other grains a fixed distance away, which in turn identify themselves as defining the perimeter of the duplicate. If the duplicate is supposed to be 10 times the size of the original, each square surrounding the embedded shape will map to 10 squares of the duplicate's perimeter. Once the perimeter of the duplicate is established, the grains outside it can disconnect from their neighbors. The same algorithm can be varied to produce multiple, similarly sized copies of a sample shape, or to produce a single, large copy of a large object. "Say the tire rod in your car has sheared," Gilpin says. "You could duct tape it back together, put it into your system and get a new one." The cubes — or "smart pebbles" — that Gilpin and Rus built to test their algorithm enact the simplified, two-dimensional version of the system. Four faces of each cube are studded with so-called electropermanent magnets, materials that can be magnetized or demagnetized with a single electric pulse. Unlike permanent magnets, they can be turned on and off; unlike electromagnets, they don't require a constant current to maintain their magnetism. The pebbles use the magnets not only to connect to each other but also to communicate and to share power. Each pebble also has a tiny microprocessor, which can store just 32 kilobytes of program code and has only two kilobytes of working memory. The pebbles have magnets on only four faces, Gilpin explains, because, with the addition of the microprocessor and circuitry to regulate power, "there just wasn't room for two more magnets." But Gilpin and Rus performed computer simulations showing that their algorithm would work with a three-dimensional block of cubes, too, by treating each layer of the block as its own two-dimensional grid. The cubes discarded from the final shape would simply disconnect from the cubes above and below them as well as those next to them. True smart sand, of course, would require grains much smaller than 10-millimeter cubes. But according to Robert Wood, an associate professor of electrical engineering at Harvard University, that's not an insurmountable obstacle. "Take the core functionalities of their pebbles," says Wood, who directs Harvard's Microrobotics Laboratory. "They have the ability to latch onto their neighbors; they have the ability to talk to their neighbors; they have the ability to do some computation. 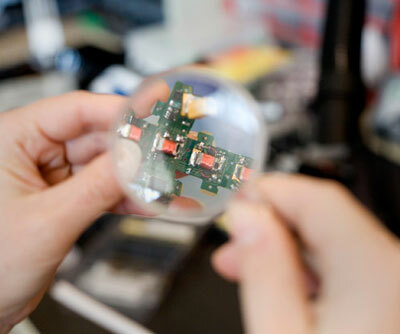 Those are all things that are certainly feasible to think about doing in smaller packages." "It would take quite a lot of engineering to do that, of course," Wood cautions. "That's a well-posed but very difficult set of engineering challenges that they could continue to address in the future."